Happy Monday everyone! It has now been one week since the Summer House giveaway post featuring Lily Ashbury. 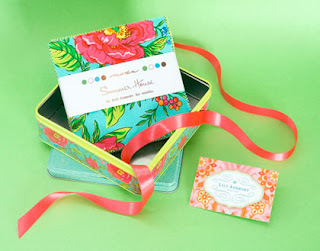 That means it's time to randomly select a winner of the Summer House Charm Pack + tin. "I love the summer house Olive Zest Maxine, love the mix of the shades and the flowers. E-mail stephanie[at]fatquartershop[dot]com with your full shipping address to claim your prize! Congratulations again Debbie! !